It packs a ‘thunder’ punch, has a clean finish yet is geared for the advanced player. Consistently big projection across the strings. There’s more sweetness when it’s plugged in. 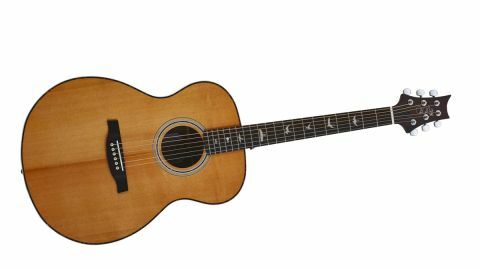 At this year’s NAMM show in California, PRS unveiled an impressive array of six brand new acoustic guitars. The name of one of these latest Paul Reed Smith instruments - the SE T40E - sounds like it could be the latest robot in the most recent Star Wars franchise. Let’s unpick it so we know what we’re dealing with. SE is the series the guitar belongs to, described as ‘High-value acoustics with a familiar appeal.’ The T stands for the Tonare body build (Tonare translating as thunder) as opposed to the Angelus (or angel) cutaway, which also features in the SE Acoustic series. The 40 refers to the combination of woods used to make the guitar - in this case, ovangkol back and sides with a solid spruce top. The other guitars feature maple or mahogany back and sides. The E stands for Electronics. The guitar arrives for review in a smart, well-built black hard case. Inside, the guitar nestles snugly in its place. The solid spruce top sports a fine amber grain, stark against the black lining of the case. The Tonare shape gives the main body a wide belly so the ebony bridge looks almost central from some angles. The soundhole is decorated with double rings of white and black acrylic. What is most distinctive is the tiger acrylic sandwiched into these rings. This tiger acrylic shimmers like a mother of pearl and while it isn’t particularly stripey, it does capture the lighter tones of the spruce top with the darker wood of the back and sides. This same material spans the circumference of the top so it gives the guitar a superior, classic quality of finish. Rising up from the soundhole the dark ebony fingerboard contrasts well with the lighter spruce top. You can’t but make mention of the bird inlays. Whilst they border on the gimmicky side, they are still functional, appearing where all marker dots would usually appear. They also are inlaid using a rather respectable mother of pearl which works well with the tiger acrylic. The headstock shape brings to mind the stylised comic book Bat-Signal, but more than that, its jagged form feels like it’s intended for a rocker’s guitar, not acoustic merriment. Fans of Carlos Santana, one of PRS’s signature artists, would be proud. In spite of the jagged design the silver, metallic coloured PRS designed tuners have a simple aesthetic, which stops the general appearance of the headstock seeming too edgy. The cursive signature logo, which sits between the upper and lower tuning heads, adds a personal touch to the design, giving the guitar a more hand-crafted feel too. Removing the guitar from its case, the ovangkol back and sides are joined together with smart white body binding. Ovangkol is a dense, heavy wood. While you may not be so familiar with the name of this particular type, it is used widely across the guitar industry from Yamaha to Taylor and Ibanez in the construction of all types of guitars - both acoustic and electric. On this SE model the ovangkol back and sides reveal a rich brown grain with a texture not dissimilar to corrugated copperfoil. The SE T40E produces a well-balanced sound. The guitar’s USP is probably the evenness of the projection across the bass, mid and treble - consistently strong. It delivers a reliable sound across the fingerboard with minimal gutteral noises too. That’s not to say the guitar doesn’t have its sweet spots. There are some fine harmonics and the upper strings certainly have some sweet tones but the general feeling we get from this guitar is that it wants to be played loudly. It is, in essence, an extrovert - so possibly not the instrument for those who prefer the mellower, smaller sound. It’s not a dreadnought, but it wants to be. One reason the projection is strong might be in the guitar’s unique combination of the more traditional steel-strung ‘X’ bracing with classical fan bracing under the belly of the guitar. This means that the top has effectively a rounder, freer sound enabling considerably more projection. Combined with the comparatively larger sound provided by the Tonare build, and a hard bone saddle for swift transference of sound, there is plenty of oomph to support either fingerstyle or plectrum-playing. Our preference on this guitar is for plectrum and chordal playing. Fingerstyle is good too but the guitar really needs a seasoned acoustic professional to bring the most out of it. No cut-away leaves the top end trickier to handle for the left hand. The action is set up so that there’s a reasonable distance from the strings to the fingerboard with plenty of space for the strings to resonate. As a consequence the left hand does need to work a little harder to navigate the mahogany fingerboard. The right hand and arm feels very comfortable, aided by the big curve of the body. There’s a lot of movement and it’s easy for the right hand to change up the tone as the music dictates. It just needs a bit of extra control when wielding the bigger sound. As such, this guitar isn’t for beginners, it is for the more advanced acoustic player. Even classical crossover artists might have a little bit of trouble with this one. Given the natural volume of this guitar you’d think there would be almost no need for the addition of electrics but there they are - Fishman GT1. There’s an undersaddle pickup and a soundhole mounted preamp which includes volume and tone controls. These are discretely placed in the soundhole and easy to use. Through an amplifier the guitar sounds possibly sweeter than when unplugged. Without these other guitars for comparison it’s hard for me to make similar comments, but the general sound of the guitar is a bright one and we wouldn’t necessarily have said that it was lacking anywhere in the mid-range. Ewald also recommends the guitar would be suited for more solo playing, rather than it being used in a band setting. For the advanced player there’s certainly more to get out of it and the robust sound of the guitar certainly supports this. Guitarists Martin Simpson and Tony McManus are two such advocates for PRS acoustic models. At £715 this is no budget model, though it does include the hard-shell case and there’s an adjustable truss rod for bespoke fine-tuning of the action. For the advanced player this guitar is a worthwhile investment. The PRS SE T40E is no C3PO or R2D2, but it certainly has enough character to bring your musical performances to life.